Ah, the first BakerAcres blog post. I suppose I should start with some sort of mission statement. That’s what you do, right? 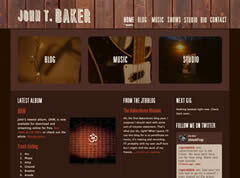 What I guess I’ll use this blog for is to pontificate on music, it’s making and recording. I’ll probably shill my own stuff here but I might shill the work of my friends or maybe bands I play with. I might also discuss trends in recorded music. I’ve been collecting records most of my life (I still call them records no matter if they’re vinyl, shiny discs or invisible, virtual records I download) and I’ve been an avid reader of liner notes all that time. There are mythic recording studios I’d love to see. Wizard-like producers I’d love to meet and watch work. This is all because of reading the credits on the backs of albums I’ve acquired over the years. I always have at least a couple of recording projects going and any given time. I’m just finishing up one album “Woodgrain” and am about halfway through writing and recording a gruesome concept album that has been a departure for me. But it has been so fun to make. I have collaborated with as many musician friends as I can on it. Everybody, even non-musicians, has contributed something. A song title here, a lyric or plot idea there. Packaging ideas. They’re coming in from all over. And I love it. Anyway, that’s the plan with this blog. I hope you might feel compelled to comment or contact me just to say hello. My name is John T. Baker and I approve this message. This entry was posted on Thursday, December 2nd, 2010 at 3:38 am	and is filed under Music Thoughts. You can follow any responses to this entry through the RSS 2.0 feed. Both comments and pings are currently closed.